Evocative of traditional colonial design, Window World’s Raised Panel Shutters add an accent of old-world style. Elegant panel dimensions with deep shadow lines dress up any exterior with easy sophistication. 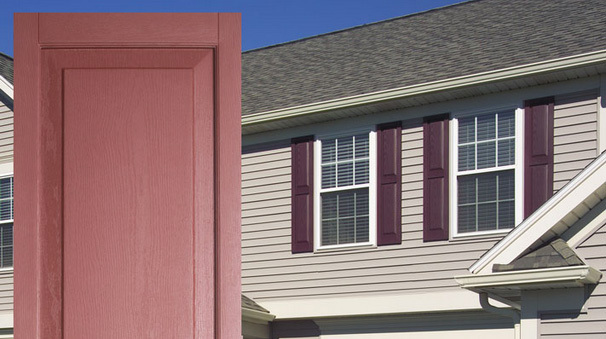 With their solid wood look, they are the perfect touch to complement a new entry door or wood-grain siding. Quarter-round and elliptical shutter top options perfectly accent shaped windows. 14 colors and custom sizing options fit unique needs. Color-through manufacturing process resists fading and hides scratches for a fresh-painted look that lasts forever. Textured vinyl achieves real-wood look without the maintenance of traditional materials. Built with quality raw materials to endure years of exposure to inclement weather. *All colors may not be available in all markets. Colors will vary based on your screen settings. Please make final color selection using actual vinyl samples provided by your Sales Representative. Ready to improve the curb appeal of your home? Contact Window World of Huntsville today for a free in-home estimate! I would like to receive the latest news and promotions from Window World of Huntsville. Very professional installation. Install crew was on time, courteous, cleaned up entirely, and demonstrated how to operate windows before they left. Very pleased with Window World of Huntsville. Highly recommend!!! Great customer service with fast response to any issues that came up during scheduling and install. Was thorough and called multiple numbers to make sure they got in contact as quickly as possible. Quick, precise, clean and on-point price wise! What more can I say. Although it took longer than expected to get to an installation date once the contract was signed, we were very pleased with the outcome as a whole. The contact who came to our home was professional and was precise in taking measurements. The team of technicians who completed the install were not only fast with the installation, but left the area as if it hadn't been impacted in any way when they were done. The office staff were very courteous and professional. The overall experience is something I would recommend to anyone. The experience with Window World was great. The individual who came out to do our estimate was amazing and made us aware of all options available. The staff was prompt in making sure our install was completed In the timeframe as promised. The installer was great and very friendly. I would recommend window world to anyone looking for this service! Love our windows!! It updated they look of our house. Contractors were great, very friendly. The contractors were very quick, cleaned up their mess. I look forward to ordering from Window World in the future. Randy and Mary installed 14 windows and 2 sliding doors, over the past 2 days. They did an awesome job! They were awesome with our 3 dogs, our son and 2 grandsons. They answered all their questions and we're so patient with all of them. They were fun. Our home looks so much better. We highly recommend them and Window World. Ben was our sales person and he did an excellent job explaining just what we were getting, Bridgette was our office contact person, she did an excellent job as well. In fact when I needed the windows rushed she made it happen. Thanks to all of you!!! Absolutely the BEST! Every step of the process exceeded our expectations and the product is superior! Their sales, support and installation left us informed of what to expect and then they delivered excellence. Howie Tedder and his team put in 19 windows in a single afternoon; and when it came to the patio door, he wouldn't stop working on it until it was perfect by his own high standards, as if he were putting it in his own home. It doesn't get any better than that! A Wonderful Company to do business with! Couldn't be happier! A complete answer to prayer! From the moment they came by - until they finished - they were professional, helpful, kind, and a pleasure to work with! A+ Service! Highest recommendation!! Will be using them for everything!!! Window World is an excellent company with quality products and great customer service. We love the shutters that they installed on our home, and when there was a small warranty issue, they scheduled someone to come to the house right away to make the repair. We highly recommend them- 5 Stars! Window World of Huntsville did an excellent job of replacing 15 windows on my house. The price was very reasonable, the technicians were pleasant, courteous, and professional. They came on time and completed the job efficiently within the time they said they would. They did not cut any corners and cleaned up after.